Despite some problems with pacing and clunky storytelling, Endzeit is a visually lush, philosophical zombie film with a unique aesthetic. Rather than another straightforward entry in the zombie genre canon, Endzeit is more comparable to this year's Annihilation — a female-driven, ecological body horror parable. 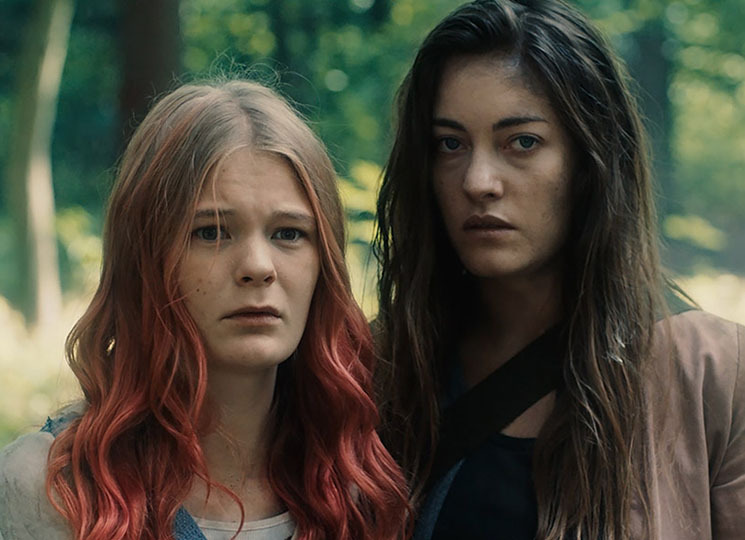 After an opening that sets up some interesting world building (which unfortunately remains unexplored), we are introduced to our two protagonists, the tough and stoic Eva (Maja Lehrer) and the vulnerable Vivi (Gro Swantje Kohlhof). Each has their own secrets and regrets they've carried with them since the onset of a catastrophic epidemic two years ago, which left Germany so decimated that only two cities, Weimar and Jura, remain populated. Eva and Vivi are recruited, along with a team of other youth, to protect these cities from the hoards of infected zombies that roam outside the city limits. When Eva and Vivi become stranded aboard a broken-down train bound for Jura, they must put aside their differences in order to fight their way back to civilization. Endzeit's greatest strength is in its visuals, a fairy tale landscape of fields, flowers and castles devoid of human life. Hellsgård makes effective use of vibrant natural colours to make these landscapes even more powerful, a stark contrast to the tiny, vulnerable humans thrust into the wild. This existential approach doesn't do many favours to Endzeit's plot, however, which relies too often on overly obvious flashbacks that disrupt the flow of the narrative. While the chemistry between Vivi and Eva is compelling, especially when they gradually begin to open up to each other, the pacing meanders. Endzeit loses itself in its visuals, which makes the stakes seem much less high. It's easy to forget there are even zombies in this film at all, and this lack of danger removes any sense of urgency. The zombie effects, while not front and centre in this film, aren't as visually impressive as other recent additions to the genre, but they're unique and hauntingly strange, a melding of gore and greenery growing from wounds, that fits with the film's eco-apocalypse themes. The almost total absence of male characters in the film (one with women in every major creative role) feels like a deliberate nod to the concept of the natural feminine. "Earth is a wise old lady and humans haven't paid her any rent for too long," says Eva during their long journey across empty fields and forests. A matriarchal gardener (Trine Dyrholm) who Vivi encounters living alone in the forest seems to have the answer — that rather than run away from the natural world, humans have to become one with it. It's a familiar premise for post-apocalyptic films, but one Endzeit executes with an eerie grace in spite of its shaky plot.